"Toyota can cover that price range for us." Lexus has been busy lately, releasing new models like the UX CUV, and trademarking new names like LM350 and 350h. Speaking to , Jeff Bracken, executive advisor to Toyota North America’s Lexus Division, answered questions about the brand and how it will fit in the US market in the coming years. When asked about an electric vehicle from Lexus, Bracken said "There has been no official announcement, but I would say that we would eventually have an electrified option. It could be a plug-in hybrid, an EV or a fuel-cell vehicle." It is interesting that Toyota, a company that was quick to embrace hybrid technology, has been slow to move onto fully electric models. Wards also asked specifically about a fuel-cell Lexus model based on the Toyota Mirai, and Bracken simply replied "All I can say is, stay tuned." 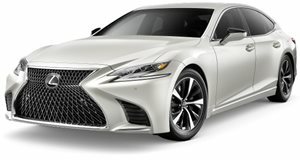 Lexus is still in the process of expanding its model range, but Bracken said "We have no plans to go down below $30,000. Toyota can cover that price range for us. We also don’t see any value in having a lineup as deep as Mercedes-Benz and BMW. Their model lineup is twice as deep as ours." Although Lexus won't introduce an "entry-level" model, the brand does have "more than 20 models not counting the UX" on the way. When asked about what other segments Lexus could compete in, Bracken said "We are still not in the entry compact utility vehicle segment. That will be the UX and will be priced under NX. We also displayed a Lexus LF-1 Limitless Concept, above the LX, at the (2018) North American International Auto Show. Those are a couple of gaps we’re trying to fill." Thanks to Bracken, we have a clearer picture of what to expect from Lexus.